When Jonathan Santlofer asked me to write a few words of introduction to Food City, written by his late wife, Joy, I felt sad but honored. Joy, my friend and colleague at New York University, died unexpectedly in 2013, leaving this book—her life’s work—to be completed posthumously by grieving family and friends. Food City is a tribute to the memory of a wonderful person, but it is also a very good book, standing easily on its own as a welcome contribution to food history and to the field of food studies. 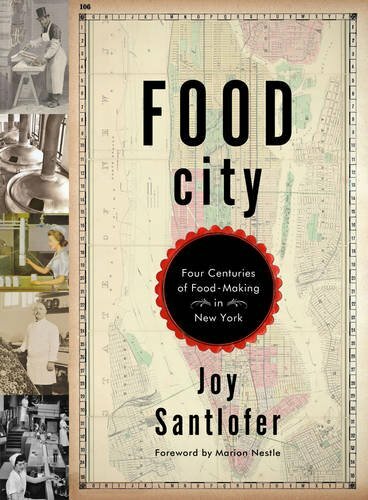 In her work at NYU, first as a master’s student and later on our faculty, Joy discovered evidence of New York City’s food manufacturing past and began writing about this largely unexplored topic. She published her discoveries as short pieces that formed the basis of this book and also of her work as editor of the journal of the Culinary Historians of New York. For those of us who use food to explore the most pressing social, environmental, and political issues through the lens of food—how we at NYU define food studies—Food City is exemplary. In recounting the stories of the rise and fall of New York City’s bakeries, breweries, dairies, and meat-packing plants, and of its makers and sellers of flour, sugar, pasta, ice cream, chewing gum, and soda water, Joy Santlofer necessarily wrote about slavery, immigration, unions, child labor, wars, ethnic and racial discrimination and segregation, and the migration of populations to the suburbs and their eventual return. How odd, she said, to think that factories spewing filth once occupied the sites of today’s luxury apartments. Food City’s theme is the historical arc from artisanal food manufacture to the emergence and eventual disappearance of industrial manufacture to today’s newly artisanal production of beer, chocolate, and coffee. Joy put her scholarly curiosity to good use. She had a knack for finding just the right detail to bring history to life. I had no idea that New York City housed 2,000 bakeries by 1900, or that one of them employed 700 horses to deliver bread door to door, nor did I know that through the 1930s, $14 a week was the standard wage for factory workers, a synagogue on Rivington Street was located over a still, and cattle had to be driven across the entire length of 44th Street to be slaughtered. Such tidbits are so vivid that you even get a sense of what the City must have smelled like until well into the last century. For several years, Joy had the office next to mine, and I was able to check with her often on the book’s progress. I couldn’t wait for it to appear and at last we have it. It’s heartbreaking that she did not live to see its publication, but Joy Santlofer leaves Food City as a generous gift to us all. The New York City health department has just released a summary report on what it does. It’s hard to read online (light blue and red print) but it does have a section on what the department is doing about obesity, diabetes, and cardiovascular disease. But nothing is in the table of contents about the calorie-labeling initiative, probably because that plan is still under litigation. If you want to know more about public health in NYC, this is a good place to start.